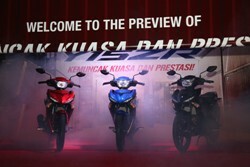 Welcome to Hong Leong Yamaha Motor | THE ALL-NEW YAMAHA Y15ZR – ULTIMATE POWER AND PERFORMANCE! THE ALL-NEW YAMAHA Y15ZR – ULTIMATE POWER AND PERFORMANCE! 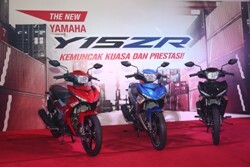 05 Aug THE ALL-NEW YAMAHA Y15ZR – ULTIMATE POWER AND PERFORMANCE! 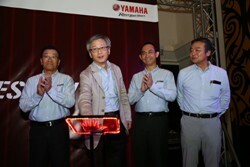 KUALA LUMPUR, 8 AUGUST 2015 – Hong Leong Yamaha Motor Sdn. Bhd. 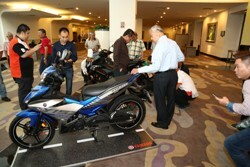 (HLYM) today revealed to dealers and media representatives, its latest addition to their stable of premium motorcycles, the all-new Yamaha Y15ZR during a special luncheon at the Berjaya Times Square Hotel, Kuala Lumpur. The all-new Yamaha Y15ZR features a new powerful single cylinder SOHC 4-stroke 4-valve liquid-cooled 150cc fuel-injection engine providing a fresh sense of acceleration to satisfy those who desire a sporty ride, coupled with a lightweight frame for excellent maneuverability on all types of road conditions. “A new power has arrived onto our roads in the form of a compact and powerful Y15ZR. With power in hand and lightweight agility, I am confident this new bike will appeal to our performance-oriented riders” said Dato’ Jim Khor Mun Wei, Managing Director of Hong Leong Yamaha Motor at the launch. 1) A multi functional and stylish meter panel incorporating a programmable LCD display. 2) A pair of sleek modern looking LED Position Lights with 8 bulbs for a brighter light output. 3) An anti-lock chain holder to keep the motorcycle chain in place for maximum safety. 4) A larger front disc (245.0mm diameter) complementing the powerful braking system for added safety. 5) A bold and sleek designed LED rear light that is brighter and more visible for both day and right. 6) A sporty rear fender designed as per fenders featured on Superbikes. 7) A pair of modern signal lights that emit strong bright lights for added safety. 8) A 3.5” die-cast wheel with broad rear tyre (120/70-17) for maximum ground contact, for a sure grip and safe ride. 9) A sporty exhaust system with 3 levels of mufflers providing a sporty sound for a more joyful ride. 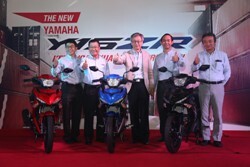 The all-new Yamaha Y15ZR comes in a choice of 3 attractive and trendy colours and graphics in Black, Blue and Red with an estimated retail price of RM 8,000.00.
potential to be our next bread and butter model of the near future” quipped Dato’ Jim. The all-new Yamaha Y15ZR is set to hit our roads and will be available at all our authorised Yamaha dealers nationwide from end August 2015. The public will be able to view, touch and feel the all-new Yamaha Y15ZR at the Yamaha Motor Show 2015 currently being held at the Lower Ground floor, Berjaya Times Square KL from the 8 to 9 August.